Eight years: that’s how long an American president can serve, and it’s the age at which children start to solve problems on their own. It’s also how long we’ve had President Obama’s signature reform of health care, the Affordable Care Act (ACA). Obama achieved goals that eluded every one of his predecessors: the ACA cut the nation’s uninsured population by half, extending coverage to 24 million. It funded this expansion by increasing economic equity, through taxes on the nation’s wealthiest one percent. All across the country last year, thousands of activists flooded into streets, Town Halls and Congressional offices to beat back the GOP’s attempts to repeal the ACA and gut Medicaid. They succeeded in their defense, though the GOP’s efforts to undermine funding for health care continue. So People’s Action member organizations from Maine to West Virginia turned out to mark this moment, and to launch the work that still needs to be done. Roughly 25 people hand-delivered cards from more than 200 Mainers from across the state, sharing their health care stories. “My wife is receiving care for recently diagnosed breast cancer. 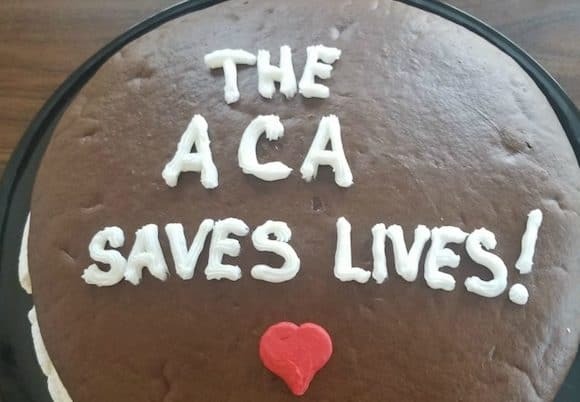 We have ACA coverage. Without it, I’m sure we’d soon be bankrupted,” read one message from Brewer. 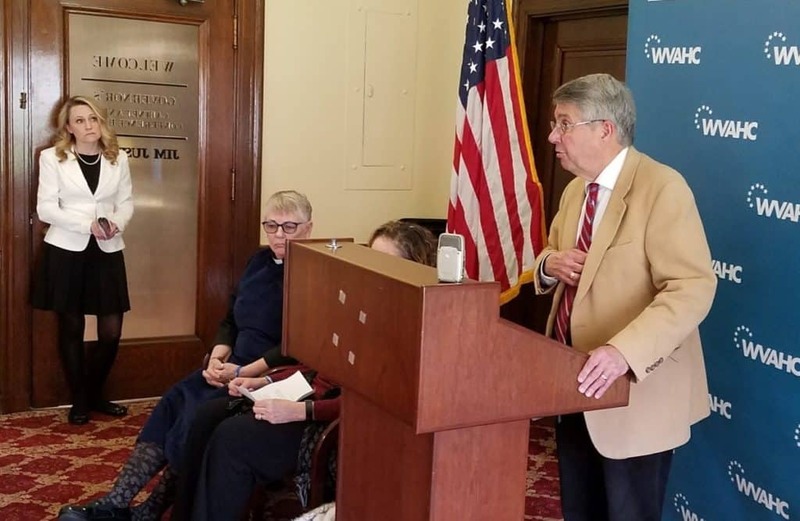 Members of the West Virginia Citizen Action Group gathered at their state capitol in Charleston to talk about the difference the Act has made in their lives. Nearly 250,000 gained access to coverage in the state, cutting the uninsured rate by more than two-thirds. 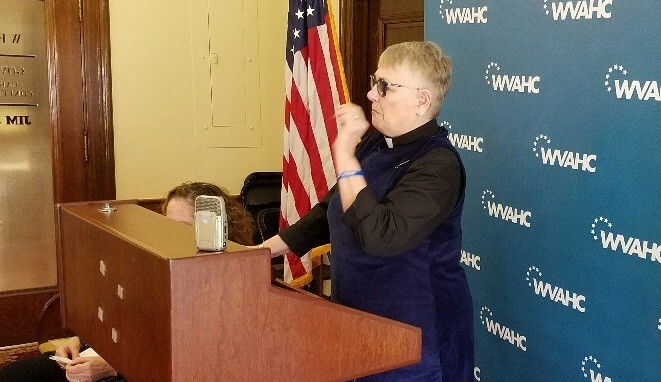 “These are not statistics, although I love hearing how many people have been affected in their lives,” said Rev. Janice Hill from Parkersburg. “They’re real people. They’re your friend,” she said. Rev. Hill’s daughter suffers from a rare form of cancer, so her life literally depends on access to affordable health care. Hill memorably challenged Senator Capito on her daughter’s behalf last June, as part of a group of West Virginians who caravanned by bus to Washington, D.C. to confront their senators ahead of their vote on the ACA. Dr. Dan Foster, a former state senator, highlighted the difference treatment for opioids has made for those battling addiction in West Virginia, and to the health of the state’s workforce. “We cannot have a healthy economy in West Virginia without healthy people, and the Affordable Care Act is a driver of that economic development,” he said. They called attention to Tenney’s support for the Trump administration’s efforts to take away as much as $1.5 trillion in funding from Medicare and Medicaid to pay for tax cuts for the wealthy. Stan Scobbie described how eight years ago, just months before passage of the ACA, his son David was pronounced dead – twice – in emergency rooms because of an uninsurable cardiac condition. David survived, and thanks to the ACA now has medical coverage, but he racked up more than $500,000 in debts from those two incidents. To be sure, these health care warriors know millions in our country still don’t have the care they need, and the insurance industry siphons off billions in profits. So they aren’t resting on their laurels. They know there’s work to be done, and when the time comes, they’ll be ready.